Welcome to the Feasts for the Future blog! This is the blog for Feasts for the Future, part of an AHRC funded project exploring the imagination of alternative presents and better futures. Follow the link below for our project webpages. The blog will feature contributions from Dr David Sergeant and Dr Anastasia Somerville-Wong at the University of Plymouth, as well as other researchers, practitioners, activists, artists and those who are otherwise engaged with work that is relevant to building a more sustainable future. For more information about us and our partners, follow the link below. Achieving a better future for society can often seem impossible, a hopeless dream. But what elements of that future are already around us and just waiting to be brought forward, seized and shared? 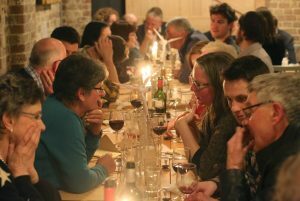 Feasts for the Future will use the act of holding communal meals as a way of bringing elements of that better future into our shared present. It will develop the Feasts as a model that might support people in envisioning ambitious alternative futures together, especially with regard to local and sustainable energy. It will also try and help communities take decisive steps towards making their visions a reality.